Farmers don’t plant by hand, plough with horses, or fetch pails of water from a well anymore. Instead, much of their work is done with technology, making farming more efficient and modern. In that light, one of the world’s leading animal welfare experts thinks technology will replace old-fashioned approaches to livestock farming, too. Prof. Ian Duncan, who has received the first international medal for outstanding contributions from the Universities Federation for Animal Welfare, acknowledges that these approaches — branding, tail-docking and other techniques that are broadly called elective surgeries — are part of farming tradition. But to keep up with the rest of the world, and demands from society, he says change is essential. 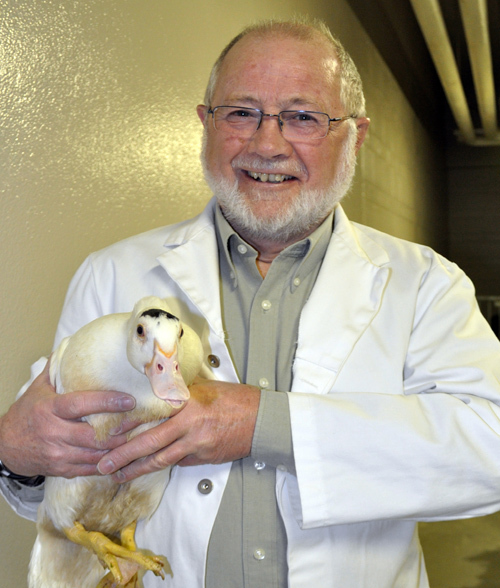 Duncan has spent most of his stellar 40-year career — including the last 22 at the University of Guelph — pioneering a deeper understanding of animal welfare on the farm. His stand against some aspects of livestock production, such as cages for sows and hens that allow very limited movement, have sometimes rubbed agriculture the wrong way. However, he says, although his role was as a change agent, his intent was always pro-agriculture, if not pro status quo. I write about Duncan’s position in this week’s Urban Cowboy column in the Guelph Mercury. The photo above is from a story by Susan Bubak published on the University of Guelph website.